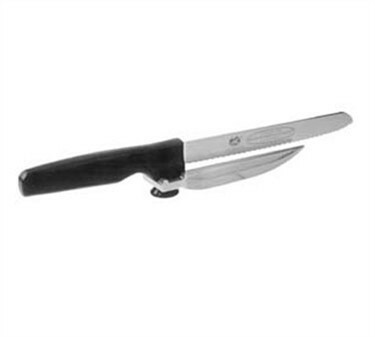 This knife for cutting meats and cheeses has a serrated edge and a built-in slicing guide which helps to ensure a perfect, straight cut every time. It measures 8 inches from the handle to the tip of the blade and features a slightly curved handle for a comfortable hold. This is the Magna Wonder Knife from Franklin Machine Products. Its number is fmp-280-1335.